Chandigarh is a city and a union territory in the northern part of India that serves as the capital of the states of Punjab and Haryana. As a union territory, the city is ruled directly by the Union Government and is not part of either state. The city experiences extreme climate and uneven distribution of rainfall. The roads in Chandigarh are surrounded by trees and it has the third highest forest cover in India at 8.51% following Lakshadweep and Goa. 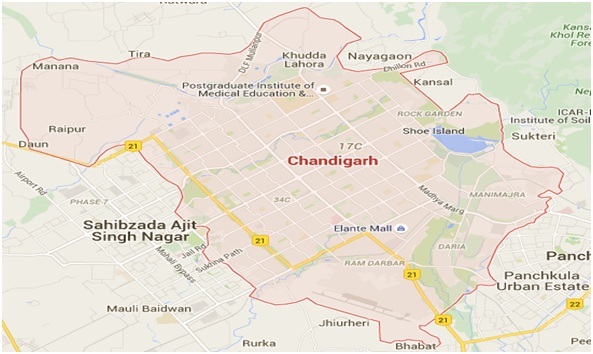 Chandigarh is a city and a union territory in the northern part of India that serves as the capital of the states of Punjab and Haryana. As a union territory, the city is ruled directly by the Union Government and is not part of either state. The city experiences extreme climate and uneven distribution of rainfall. The roads in Chandigarh are surrounded by trees and it has the third highest forest cover in India at 8.51% following Lakshadweep and Goa. This UT was planned by the famous French architect Le Corbusier. The city derives its name from the temple of "Chandi Mandir" located in the vicinity of the site selected for the city. The deity 'Chandi', the goddess of power and a fort of 'garh' laying beyond the temple gave the city its name "Chandigarh-The City Beautiful". Agriculture: 1400 hectares of cultivable land. Forest cover is 27% of the area. Zakir Rose Garden, Rock Garden, Shanty Kunj, Lake, Museum, Art Gallery, Capital Complex, And National Gallery Of Portraits.